The purchase and sale agreement is the contract between the buyer and seller of real estate. It sets out the obligations of each party from the time the property is taken off the market to the closing. 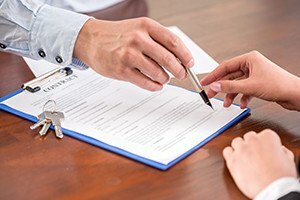 A standard form agreement is used in most residential real estate transactions in Massachusetts. Both the buyer and seller will need to negotiate the terms of the agreement to protect their respective interests. Any personal items included in the sale. While these items are important, other provisions in the purchase and sale agreement should be carefully reviewed to ensure that you understand their terms and your obligations. You may need to negotiate some of these provisions to protect your interests. The mortgage contingency clause is a critical part of the purchase and sale agreement. It specifies the amount of the mortgage loan that the buyer must apply for and secure in order to buy the property. It also states the date by which the buyer must obtain the mortgage. If the buyer cannot get a mortgage before the specified deadline, he or she can cancel the deal and obtain a refund of the money he or she has already put down for the property. Whether you are the buyer or seller, you should consider the impact that the terms of the mortgage contingency clause have on you and the transaction as a whole. For instance, the buyer should have a reasonable amount of time to get a mortgage in the amount specified. The seller, however, will not want to give the buyer too much time. If the buyer is unable to secure a loan amount, the seller will want to place the property back on the market sooner rather than later. Additionally, the buyer will want to be as specific as possible regarding the terms of the mortgage loan that he or she must obtain, whereas the seller will want the terms to be broad to limit the buyer’s ability to cancel the deal. The home inspection is typically conducted before the purchase and sale agreement is signed. Any provisions regarding the home inspection are removed unless the seller needs to make repairs before the closing, such as improvements to the septic system. If the seller needs to make repairs prior to closing, the home inspection contingency clause is revised or added to the agreement. Any repairs or credits should be detailed and negotiated in the agreement. Under Massachusetts law, the owner of a residential property built before 1978 must remove lead whenever there is a child under the age of six living on the premises. The buyer has the right to inspect the property for the presence of lead, but the seller does not have to remove it. The purchase and sale agreement can include a provision that addresses the buyer’s right to inspect the property for the presence of lead and any possible remedies for the cost to remove it, including the right to termination if removal costs exceed a certain amount. The property transaction attorneys at Pulgini & Norton represent Boston buyers and sellers at every stage of the purchase and sale process. We can review and explain the terms of the purchase and sale agreement to help you understand your rights and obligations. We can skillfully negotiate and draft provisions to ensure that your interests are protected. We serve clients in Cambridge, Lowell, and Hyde Park, among other Massachusetts communities. For a consultation, call us at 781-843-2200 or contact us through our online form.